Over twenty years ago, Roland changed the sign industry with the success of the CAMM-1 cutter. 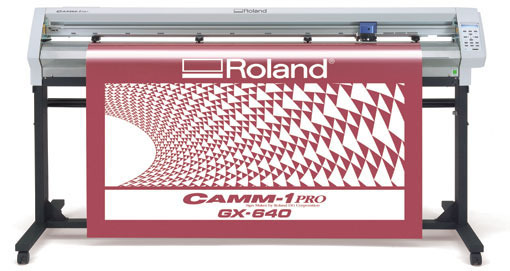 Now the 64” CAMM-1 PRO Series GX-640 continues that tradition as the largest, most technologically advanced cutter Roland has ever produced. Perfect for grand-format jobs ranging from signs and banners to vehicle restyling, floor graphics and more, the GX-640 also features revolutionary Roland Quadralign™ technology to precisely read crop marks on pre-printed data. This makes it an excellent complement to VersaExpress RF-640 and Soljet Pro 4 XR-640 printers for full contour-cutting color graphics of virtually any size and shape. The GX-640 outperforms the competition at every measure thanks to the industry's newest, most advanced DC servo motor technology, an expanded grit roller system for the heaviest media rolls and integration with premium Roland software solutions including CutStudio and VersaWorks. Based on decades of engineering excellence and backed by a three-year warranty, the GX-640 combines the industry's smartest and most efficient contour cutting technology with the power and performance you have come to expect from Roland. On its own, or paired with a VersaArt or SOLJET XJ printer, the GX-640 is the best value on the market today. Equipped with the industry’s most powerful cutting motors , the GX-640 is ideal for long, uninterrupted production runs and years of reliable service for your business. In fact, GX-640 servo motors are the same motors that drive Roland’s flagship VS-640i printer/cutter. For optimum precision, the GX-640 features a curve-smoothing function that ensures accurate cutting at the highest production speeds. From two to 72 inches wide, the GX-640 handles any media that comes your way from vinyl to paint mask, reflective vinyls, twill, heat transfer and sand blast material. A redesigned grit roller system allows the heaviest rolls to be loaded and cut. Up to six additional pinch roll assemblies can be installed for the highest performance. Roland CutStudio software makes it easy to draw and edit circles and curves, position text on lines, and import files in a wide range of formats from popular design packages. The software includes a Windows printer driver, Windows plug-ins for Adobe® Illustrator® and CorelDRAW®, and Mac Plug-ins for Adobe® Illustrator®. The result is a seamless, user-friendly operating environment. The GX-640 is fully integrated with Roland VersaWorks RIP software, included with every Roland inkjet device. 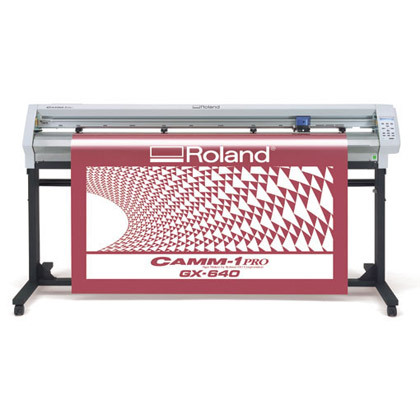 As a result, Roland printer owners can pair their VersaArt and SOLJET XJ printers with the GX-640 to contour cut pre-printed graphics for signs, banners, t-shirt heat transfers, POP, vehicle wraps, labels and decals. The GX-640 features revolutionary Roland Quadralign™ technology that precisely reads crop marks on pre-printed data and aligns the graphic for perfect contour cutting. VersaWorks can be used to operate up to four Roland inkjets or cutters simultaneously. The front panel on the GX-640 includes buttons for frequently used settings such as blade force, cutting speed and origin point. It stores cutting conditions for up to eight pre-set jobs, including cutting speed, blade offset, blade force and tool movement speed during tool-up and cutting modes. The GX-640 comes with EXTEND mode which increases the acceptable cutting area up to an inch on either side of the outside pinch rollers. This gives the GX-640 a maximum cutting width of 65,” wider than most professional cutters on the market for better productivity. To truly automate production, the GX-640 includes an AUTOCUT function which automatically cuts the sheet after each job is finished. The user can send a series of jobs with the AUTOCUT feature and return later to find all of their work perfectly cut into individual sections. The number of passes can be set for thicker materials such as laminated floor graphics and thick reflective vinyl. The GX-640 very easily cuts polyurethane, polyester, sand blast mask, Mylar and a myriad of textile fabrics including twill and flock for decorated apparel. The OVERCUT feature cuts thicker materials by adding a margin of 1mm to the beginning and end of a vector. This ensures precise corners and accurate cuts. For the thickest and most difficult materials, the GX-640 offers an OVERLAP feature that can cut the same graphic up to 11 times, applying steady pressure for precise, complete cuts. Roland Film Design™ is revolutionary design software that has opened up the window tinting business to auto dealerships and restyling professionals. Loaded with powerful design features, Film Design can be used with any brand of automotive window film. It offers access to more than 2,000 different window film pattern kits that cover more than 1,000 different vehicles. The GX-640 combines unbeatable performance with legendary Roland reliability. As further proof of its unmatched reliability, Roland offers an unprecedented Three-Year Trouble-Free Warranty for the GX-640 when the warranty is registered within 60 days of delivery. Extended warranties available.